A file photo of "Veep" star Julie Louis-Dreyfus attending the Screen Actors Guild Awards on Jan. 29, 2017, in Los Angeles. 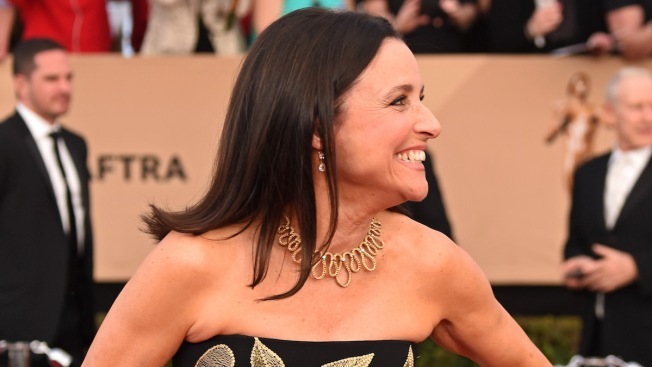 Less than four months after revealing on social media that she was diagnosed with breast cancer, Julia Louis-Dreyfus completed her last day of chemotherapy Thursday. In a new Instagram post, the "Veep" star shared the gesture her sons Charlie and Henry Hall made for the big day. My beauty boys @henryhallmusic @charlie_hall made this for me today, my last day of chemotherapy. Pretty swell, right? Ain’t they sweet? "My beauty boys @henryhallmusic @charlie_hall made this for me today, my last day of chemotherapy," she wrote on Instagram. "Pretty swell, right? Ain't they sweet?" In the video, her sons dance and sing along to Michael Jackson's "Beat It" before leaving a thoughtful message. "Mom's last chemo day!!!" the video read at the beginning. "BEAT IT!!!! Love, Henry and Charlie." Ever since revealing her diagnosis, Louis-Dreyfus has received support from friends, family, co-stars and fans from around the world. In fact, "Veep" co-stars Tony Hale and Timothy Simons recently performed Katy Perry's "Roar" to cheer up their colleague.